What is a Muft (free) WiFi Zone? The word ‘Muft’ means ‘free’ in Hindi and Urdu. As our name suggests, we are focused on shifting WiFi monetization efforts from end-users to advertisers who pay for ad-sponsored free Internet sessions. 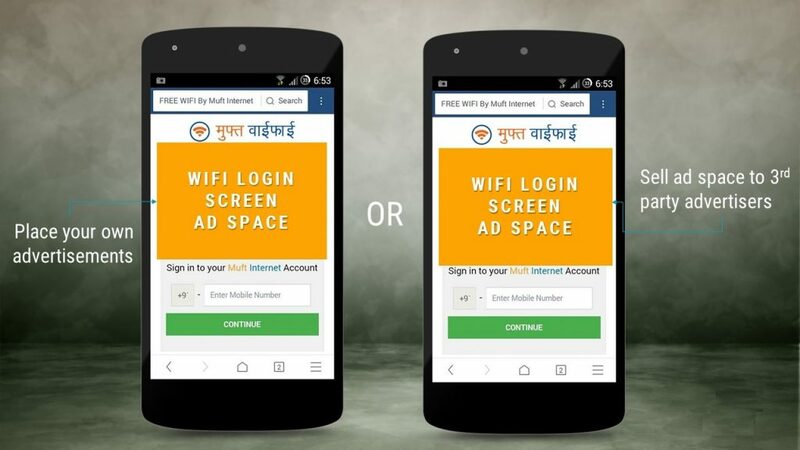 This way, the end-user gets unlimited free WiFi as long as a they watch an ad every session (usually one hour) to avail the Muft (free) WiFi service. At present, Internet service providers and advertising agencies from 5 countries use our technology to power over 250+ Muft (free) WiFi Zones. How to use Muft WiFi? How to start a Muft (free) WiFi Zone? Starting a Muft WiFi Zone is super simple – all you need is an Internet connection from your local service provider and a Muft WiFi compatible router (or your own router configured with our firmware settings). Our software is used by cafes, gyms, waiting rooms, clinics, salons and so on to power their own advertisements and track users on their WiFi zones. Our software is also used by ISPs, agents and ad agencies who want to create their own network of ad-sponsored free WiFi hotspots at different locations including but not restricted to hotels, bus stops, airports and marketplaces. How do I manage my Muft (free) WiFi Zone? The ad-spaces (and the WiFi zones) are managed with our online WiFi management and advertising software. With this online software, you get a detailed (mobile number and access time) log of every user that accesses the WiFi service. 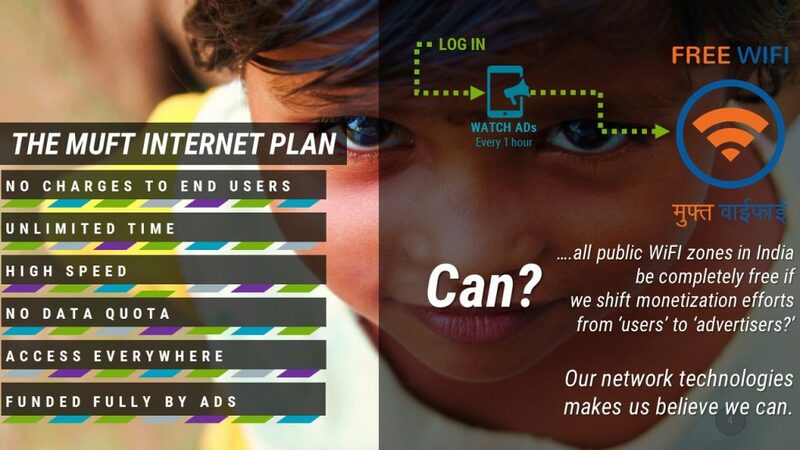 Furthermore, you can target your ad campaigns to a specific router. 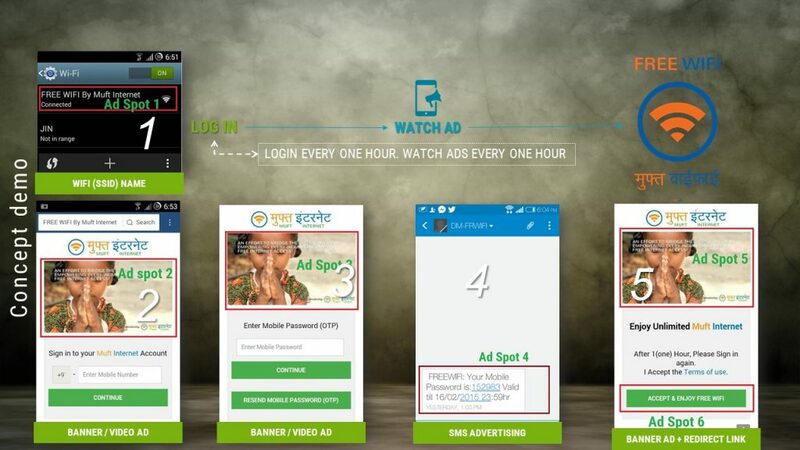 These hyperlocal ads can be your own (native) or can be sold to 3rd party advertisers. How much does it cost to start a Muft (free) WiFi Zone? Hardware – You can use Muft WiFi software on your own router or buy a pre-configured Muft WiFi advertising router online. Software – With Muft WiFi Management and Advertising cloud-based software; you can manage and monetize all your WiFi zones remotely. Service – Our system ensures WiFi security (system logs, free SMS passwords to authenticate users). The Internet bandwidth expenses is borne by the WiFi Provider. Maintenance – Our software is centrally cloud controlled and thus reduces the need for network maintenance. However, if the WiFi breaks down – we provide low cost maintenance services. The premium plan of the WiFi Management Software (we dont place ads) – At a groundbreaking cost of Rs. 1 per user, you can create your own private WiFi ad-network and sell these ads to your advertisers. We offer THE lowest price in all of Asia and Africa. Find us a competitive quote and we’ll beat it. 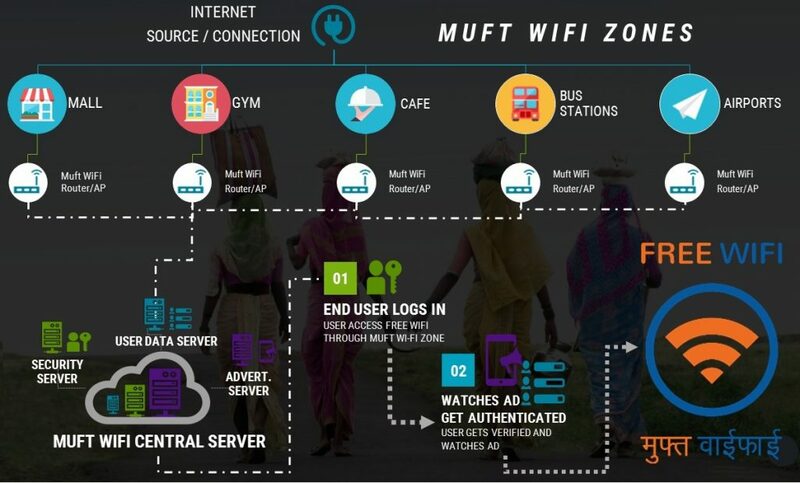 The free plan of the WiFi Management Software (we place some ads) – With this you get all the benefits of Muft WiFi’s software such as user tracking, mobile number logs and ad management – however, we place ads 30% to 50% of times on your end-user’s login page to recover our costs. The best part? You get paid 50% of revenue generated from our advertisers. Reseller plan – Interested in selling Muft WiFi’s premium software, routers and WiFi solutions in your own city/state? Contact us! We will be happy to help.